In the year 2061, three friends grapple with revolutionary change when Sprout Computers releases the most visionary piece of personal technology ever created. 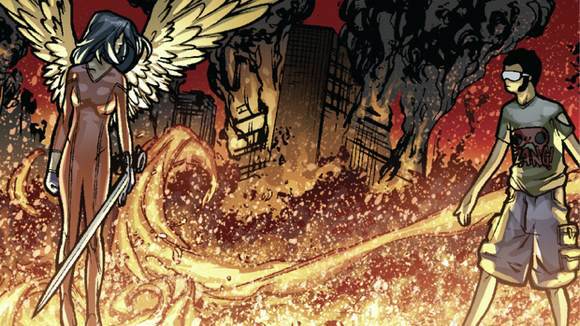 The latest sci-fi mindbender from writer Greg Pak ("Planet Hulk") and penciller R.B. Silva ("Jimmy Olsen")..
2013.01.22 - "Vision Machine" goes to Sundance! 2012.10.12 - Debuting the Vision Machine iPad app at the New York Comic-Con! 2011.04.10 - Greg Pak gives away FREE "Vision Machine" trades at MoCCA TODAY! "Vision Machine" writer and director Greg Pak will be a panelist on the "There's an App for That" panel at the Film Independent Forum in Los Angeles at 3:30 on October 27. 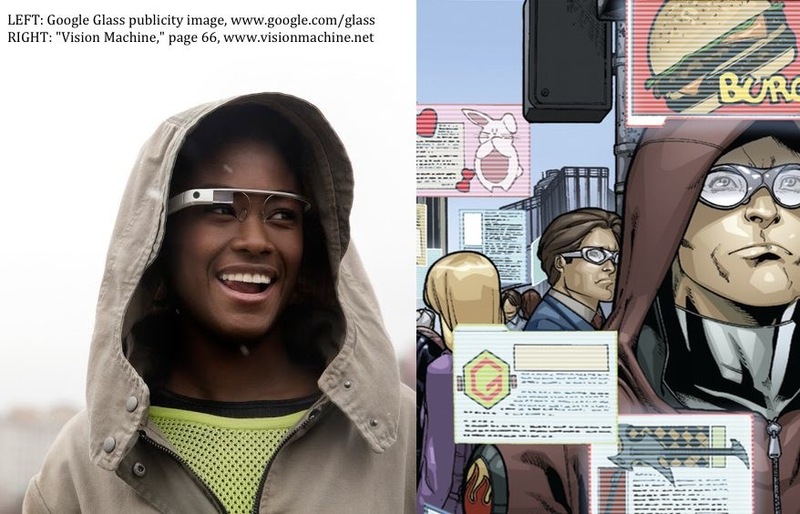 If you're interested in how Google Glass might affect your life in the next few years, read "Vision Machine" today. 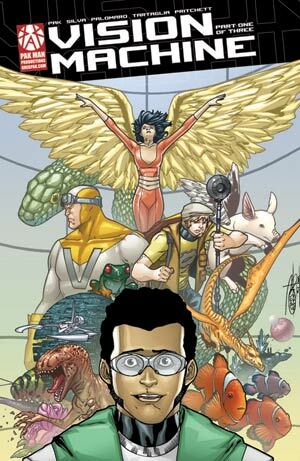 "Vision Machine" is a FREE graphic novel and iPad app written by Greg Pak and drawn by R.B. Silva that explores what happens when Sprout Computers releases the iEye, a pair of glasses that lets you instantly record, edit, add special effects to, and share anything you can see or imagine. It's a brand new world of insane creative opportunities -- and tremendous privacy and surveillance challenges. Instagram claims right to sell your photos: Hey, We Predicted That In VISION MACHINE! In honor of Instagram claiming the right to sell your pictures, we've launched the new "Hey, We Predicted That in VISION MACHINE" tumblr. The "Vision Machine" iPad app, written and directed by Greg Pak, is one of the featured projects that will be discussed at the Tablet Storytelling Takes Off New Frontier panel at the Sundance Film Festival on Tuesday, January 22. Pak will attend the panel, along with Scott Snibbe (Björk’s Biophilia, Beck’s Rework: Philip Glass Remixed), Eli Horowitz (Silent History), and Loc Dao (Circa 1948). "Vision Machine" app now available for FREE at the iTunes Store! The Vision Machine interactive comics iPad app is now LIVE on iTunes -- download it for FREE! Check out the "Making of the Vision Machine iPad App" video! On Friday, October 12, at 12:30 pm, writer Greg Pak will debut the iPad app version of his "Vision Machine" graphic novel at the the New York Comic-Con. Now check out the "Making Of" video that tells the story of how the cast and crew worked together to make this revolutionary interactive digital comics app! Writer Greg Pak will debut the iPad app version of his graphic novel "Vision Machine" at the New York Comic-Con this Friday with a slew of special guests! Pak will also give out free copies of the "Vision Machine" trade paperback. 12:30 - 1:30 pm - Debuting the Vision Machine iPad App! Description: Get a first look at the future of enhanced digital comics as writer Greg Pak ("Planet Hulk," "Robot Stories") and voice actor Phil LaMarr ("Futurama," "Justice League") debut the iPad app version of Pak's acclaimed sci-fi graphic novel "Vision Machine," which includes a full soundtrack, music, animation and amazing interactive features. And get a free copy of the "Vision Machine" paperback! Also featured on the panel: app developer Barrett Fox (Coco Studios), funder Karim Ahmad (ITVS), composer David Libby, sound designer Ian Stynes, and internet superstar musician Jonathan Coulton, who's interviewed in app's extras. Textless "Vision Machine" now available for remixers! My graphic novel "Vision Machine," pencilled by the brilliant RB Silva, was funded by the Ford Foundation and is distributed for FREE under a Creative Commons license that allows anyone to reuse and remix it non-commercially, as long as they credit Pak Man Productions. Now we're making it much easier for any would-be remixers out there by releasing the unlettered colored pages of "Vision Machine" for download! 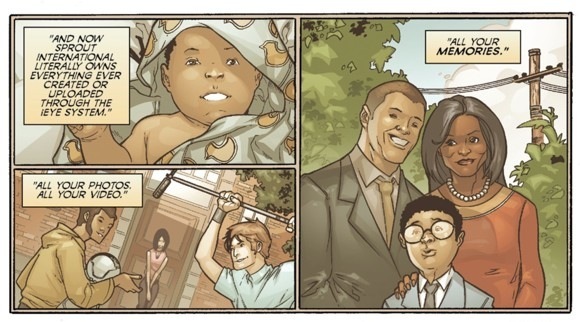 Click here to download the pdf of the unlettered "Vision Machine" graphic novel. Click here to download the lettered "Vision Machine" graphic novel. Fanboy Planet loves "Vision Machine"
The fine folks at Fanboy Planet podcast reviewed (and loved) "Vision Machine." Click here to download your own FREE copy of "Vision Machine.". © 1999-2011 Pak Man Productions. All rights reserved.